Rep. John Conyers, D-Mich., speaks during a House Judiciary hearing in April. Documents show that Conyers settled a wrongful dismissal complaint with a former female employee two years ago. Rep. John Conyers, D-Mich., settled a wrongful dismissal complaint two years ago with a former female employee who alleged Conyers made repeated sexual advances toward female staff, according to BuzzFeed. The ethics committee has launched an inquiry into Conyers' conduct, the committee confirmed to NPR in a statement. After an initial complaint is triggered, the committee has up to 45 days to determine next steps. That can include disposing of it, investigating it fully or extending the 45-day period if members need more time. The committee says it will make no additional comment until the end of the 45-day review period. Buzzfeed obtained signed affidavits, three of which are notarized and verified the documents with four people involved in the matter who confirmed their authenticity. The woman was paid over $27,000 as part of a confidentiality agreement. The money came out of Conyers' office budget, which is taxpayer-funded. Conyers acknowledged the settlement, but denies the allegations. "My office resolved the allegations — with an express denial of liability — in order to save all involved from the rigors of protracted litigation. That should not be lost in the narrative." Conyers also said that he would cooperate with a congressional investigation, as some of his fellow House Democrats have already called for. The Michigan Democrat earlier denied settling the complaint to the Associated Press, who sent a reporter to his Detroit home seeking comment. "I have been looking at these things in amazement," he told the AP, referring to allegations of sexual harassment and assault against politicians and other men in powerful industries, including at NPR. A spokesman for Conyers said he "was under the impression the reporter was speaking of recent allegations of which he was unaware of and denied." House Minority Leader Nancy Pelosi is supporting calls for an investigation. In a statement, she said, "Any credible allegation of sexual harassment must be investigated by the Ethics Committee." Earlier, her office told BuzzFeed that she was not aware of the 2015 settlement or the allegations. In her statement, Pelosi again offered support for new legislation to revamp the process for filing harassment claims on Capitol Hill, led by California Democratic Rep. Jackie Speier. House Speaker Paul Ryan called the report "extremely troubling" in a statement, but did not identify Conyers by name. There is already a formal review underway in the House on all policies regarding how harassment and discrimination claims are handled on Capitol Hill, ordered by the speaker. Ryan is also calling for making sexual-harassment training mandatory for all House employees — a change the Senate has already adopted in recent weeks. "Additional reforms to the system are under consideration as the committee continues its review," Ryan said. "People who work in the House deserve and are entitled to a workplace without harassment or discrimination." "The affidavits and reports regarding Congressman Conyers' treatment of female staff are extremely disturbing. No staff member or intern should be subjected to what these documents detail. 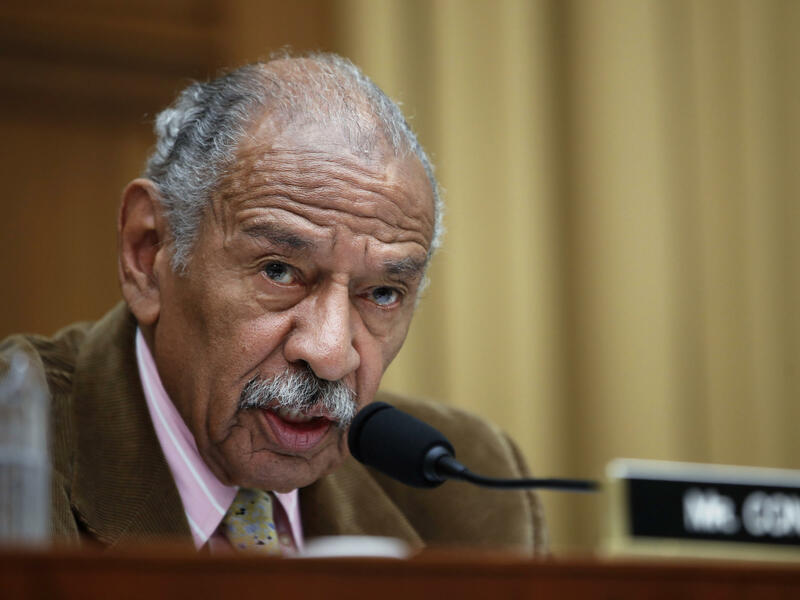 In addition to these serious charges, allegations have been made that Congressman Conyers used taxpayer dollars as an incentive for illicit behavior and to fly in women with whom he was allegedly having affairs. This outrageous conduct is completely unacceptable and needs to be investigated. If these claims are true, he should resign." Two top Democrats on the House Judiciary Committee, where Conyers is the ranking member, are calling for a House Ethics Committee investigation. Rep. Jerry Nadler, D-N.Y., called the story "extremely serious and deeply troubling." Rep. Zoe Lofgren, D-Calif., a former chairwoman of the Ethics Committee, said the panel should take up a review immediately to assess "the validity of the news account." If Democrats take control of the House in the 2018 midterms, Conyers is currently poised to serve as chairman of the House Judiciary Committee. The chairman of the Michigan Democratic Party, Brandon Dillon, echoed calls for a House investigation in a statement in which he called the allegations "incredibly serious and disheartening." Dillon added that the state party will require all candidates and campaign staff to undergo "comprehensive sexual harassment and workplace conduct training." BuzzFeed obtained the documents from right-wing provocateur Mike Cernovich, who said he turned over the documents to another news outlet, because if he reported on them it would give Democrats an opening to "discredit the the story by attacking the messenger." The report shines light on the opaque and complicated process for employees who file harassment or discrimination complaints on Capitol Hill. The federal government has paid about $17 million in taxpayer money to settle claims since a 1995 law established the process. Speier's legislation would remake that process to give more rights to victims and to provide more transparency to the public on settled claims. Meanwhile, Rep. Diana DeGette, D-Colo., told MSNBC that she was groped without consent by former California Democratic Rep. Bob Filner. "Some years ago, I was in an elevator and then-Congressman Bob Filner tried to pin me to the door of the elevator and kiss me and I pushed him away," DeGette said. Filner later ran for San Diego mayor and won, but he was forced out of office in 2013 over other sexual harassment allegations.